Looking for a cool DATE NIGHT? Maybe some SWING DANCING or SALSA! Free Lesson at each dance!! Download one of the forms below and ensure you keep receiving member benefits for 2019!! Not a member?? Now is your chance! Download a form and join today! 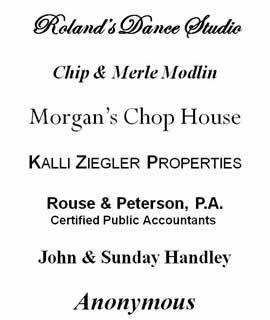 Click on the CALENDAR tab to the left to see all the dances scheduled for 2019! 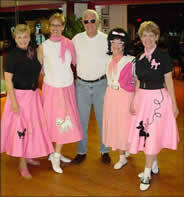 Our club hosts one dance party every month, and four of these each year are formal, dinner-dances. 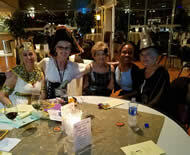 More than just dancing, each party provides for a fun night out. Our events are great for meeting people and for making new friends. 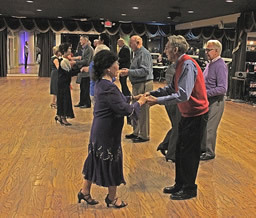 Ballroom dancing is also a good way to get some exercise and to relieve stress. 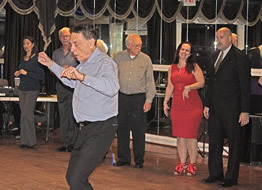 Following each dance, members meet at Morgan's Chop House to continue the fun with an "after party." 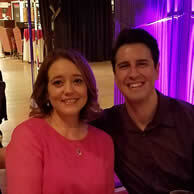 Click on photo below for some Valentine's Dance photos! The club is selling decals and license plates as you see below. Decals are 4 x 4 inches and plates are about 12 x 6 inches. The plates are $18.00 and the decals are $4.00. Supply is limited. Click HERE for information about Former Members. We dance all of your favorite steps! Foxtrot - the most popular dance from the 1920s to the 1940s, it has a faster version known as the Quickstep. Waltz - a graceful dance with a strong accent on the first beat. Swing - based on jazz or early rock and roll; includes Lindy Hop, Jitterbugplus East Coast and West Coast. Tango - a dramatic, syncopated dance from Argentina, seen in Paris in 1910. Cha Cha - a Latin dance from Cuba, popularized in the 1950s. Rumba - also Cuban, the most sensuous of the Latin dances. Shag - originated in the 1940s along the strands between Myrtle Beach and Wilmington; known as Carolina Shag. Discount admission for club members! Blast from the Past Dance!! Get tickets from Ethel or Denise NOW!! This is a fund raiser for the Cumberland County Council on Older Adults. Of course, we have no "older" adults!! View pictures from our Holiday Formal! !!! Hot Summer Nights !!! Discount admission for dance club members! Click on the photo below for more pictures from our dances! Click on the image below for photos from our Halloween Dance!! 1. The music relaxes you. 2. It takes your mind off your troubles. Click on the picture below for photos from our recent AFTER PARTY! A scheduling conflict bumped our dance out of our normal venue, so we had a party instead. Click on the picture below for more more photos from our "Party Instead of a Dance Party." Click HERE to check out the City View website for some stunning photos of our club. "[We] had a great time. More than anything the people there were incredible. We have never been to any dance when everyone made us feel so welcome. We talked about that for days after the dance. I hope that everybody there is aware of the special group that you have. We will certainly come again." Click photo below for more pictures from the party.